Last Sunday was very tiresome for me. We had to go out in the morning and later in the afternoon I was busy prepping food for the Super Bowl. By the end of the day I was totally exhausted, but it was fun watching the Super Bowl with family. The boys in my house were waiting impatiently for the Super Bowl. They would do any chores without rumbling and complaints. So with extra caution and covering for each other, boys managed well with their chores & homework and put on their best behavior to avoid any timeouts. We even told them, if it was Super bowl every day it would have been so nice. So you can imagine how boys including my hubby were so desperate to watch the game. For me it’s the time to make some food and enjoy with the family. I really never paid attention to the game or even tried to understand the game, so it was never interesting for me. My thoughts about the game are that it’s too brutal, the concussion, the injuries and those fractures, I cannot handle watching it. But this year my hubby wanted me to know about the game so that I would start liking it. So I followed the game this time with them and it was really fun watching the game when boys were rooting for Denver and I joined my hubby for Seattle. It was last December, we had a get together at our friend's house and their daughters were really nice to make kids friendly food for our kids. They even made a ginger bread house for our kids to play with. I was really impressed by the Buffalo Chicken Dip they served as the appetizer with chips. I knew that I had to try it and I made them for Nicole's birthday and it was a crowd pleaser. It’s best for parties when you have to entertain a crowd. 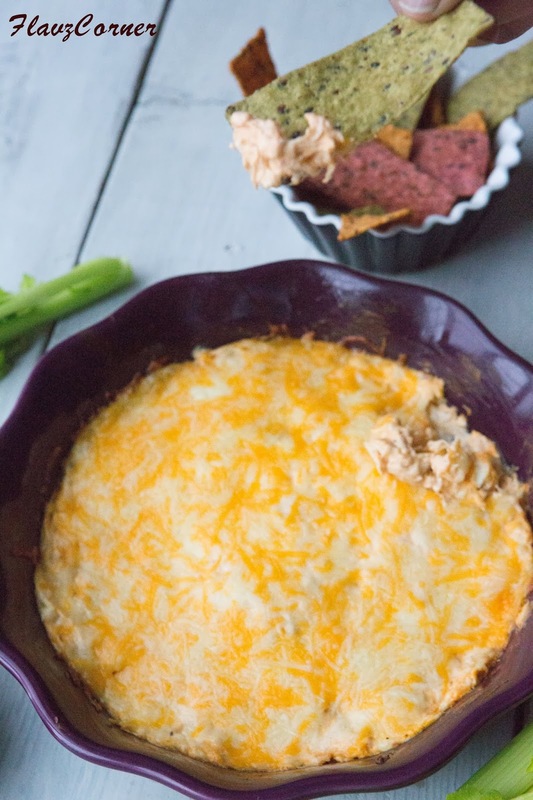 So here is the Super Easy recipe of the Buffalo Chicken Dip you are definitely going to enjoy!!! 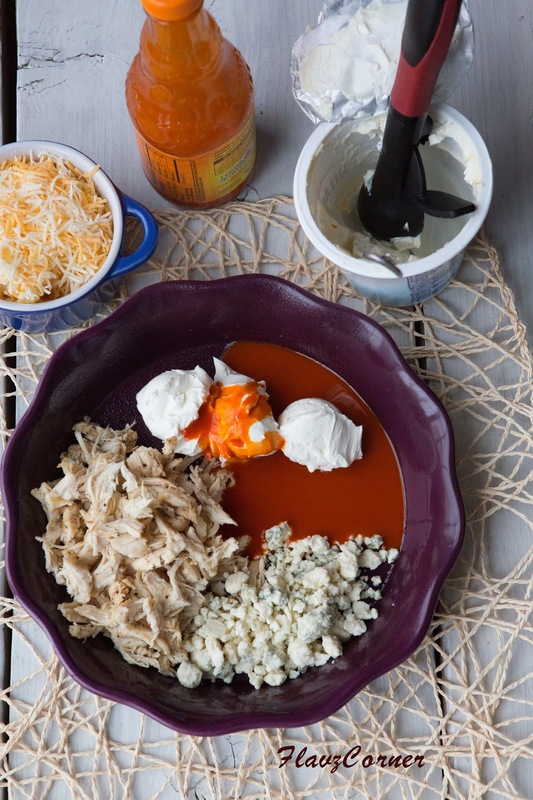 2 cups - shredded cooked chicken. Mix all the ingredients in a baking dish. Bake for 20 minutes or till the dip starts to bubble from the side. You can use the left over of Rotisserie Chicken or cook chicken with salt and pepper to taste and shred them with a knife. 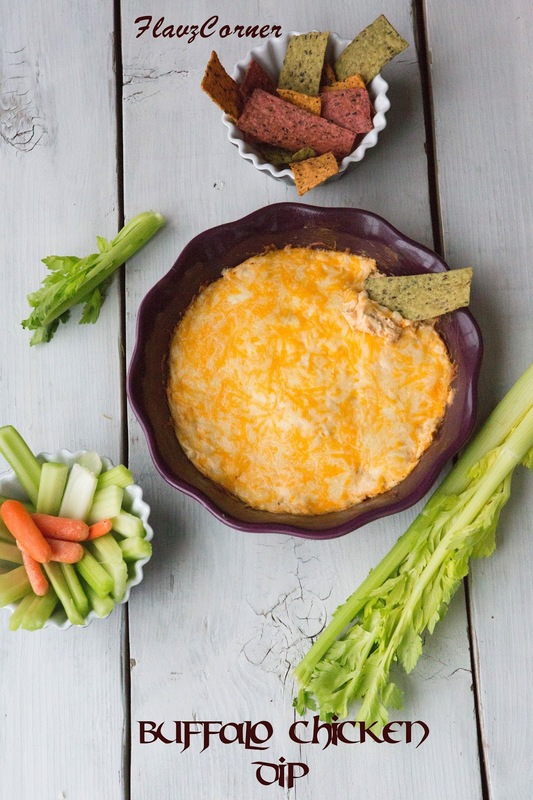 You can assemble the dip and keep refrigerated till ready to bake. This way the dip will be hot, melty and soft when served. Yeah Rafeeda, its really a yummy dip and it is very addictive!! Fantastic dip! You have certainly managed to tempt me into trying it. Thanks! Go ahead and try it and let me know. Lil Noah switched to Seatle when he noticed they were losing :) It was fun to watch them getting frustrated just like I used to do while watching Cricket back in my childhood days!!! I could eat that dip with a spoon! It sure looks very tempting! Yes, Angie, I was even eating it by itself. They are pretty addictive!! Thanks Remya for the lovely comment!!! New follower here ! Seems like I had been missing an awesome space ! Gorgeous place ! I really need to make this! I love the flavor of Buffalo Chicken Wings, but I'm not all that wild about the wings themselves. This looks like a much better way to get the flavor I crave! Thanks. Hello, first time visiting your blog and for sure it's a place to come back often. This recipe looks yummy and your photos are inspiring.